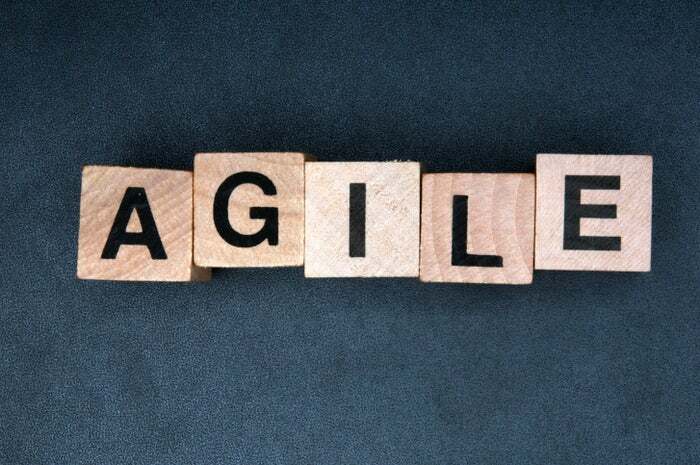 Agile, and being an agile organisation, is coming to the attention of the business world as a plausible way to navigate the disruption all businesses face today. This disruption is thanks to the transition to a digital economy and from the unpredictable nature of the world at large. Agile software development, as opposed to the Waterfall method inherited from the hardware world, uses collaboration between self-organising, cross-functional teams to set requirements and figure out how to achieve them. And, according to the Agile manifesto, the key to this way of working is embracing changing requirements at any stage, delivering work frequently and continuously improving. As important as the work that is done is the work that is not done: simplicity and speedy time to market is paramount. It is clear that the old way of working and a top-down, regimented approach will not cut it anymore. Take annual reviews, for instance. In the past they used to make sense to plot the future based on past experience and benchmarks. Today, though, we know that seismic shifts that are impossible to plan for are in fact a reality. Look at Trump, Brexit, the Cape Town drought and the astonishing rise of crypto currencies in the last year. Not only were these events unexpected, their impact has yet to play out, and can’t be guessed at. Expect the unexpected is the only thing that anyone can say with any certainty. As a side note, I believe that in South Africa we do have an advantage over the Northern Hemisphere. We’re used to absorbing a level of uncertainty as part of our day-to-day lives, and this has made us resilient and entrepreneurial, hustling to find the advantage and opportunity, even in tough circumstances. Possibly to a fault South Africans tend to adapt rather than complain, protest or debate. For instance, look at electricity and water shortages: the delivery of both should be inalienable, and the failure to do so speaks volumes about our leaders. So yes, we are all unhappy about the state of affairs, but we make plans to adapt to the new reality, and we do it immediately rather than waiting to realise our complaints have borne no fruit. Nevertheless, it sounds like we are all going to have to be nimble going forward. Long-term planning needs to factor in that things might change dramatically, and that people and companies need to be prepared to weather and maximise these shifts. To do this, the ability to change needs to be built into any plan. Sounds like we are going to have to be pretty agile, right? And especially the finance department as it ensures the right amount of money is invested in the right places, that innovation is both enabled, and culled, as necessary. That the business continues to optimise in ways that build up to significant change. And that, above all, the bottom line is stewarded into the future. So far, so good. But how do you go about making finance more agile? Well, I’d argue that tapping into business process management (BPM) principles might be the key that unlocks an agile finance department. While BPM has its origins in the 1990s, much of its philosophy resonates with the Agile movement. Practices such as having a well-defined strategy and understanding how core processes underpin it; consulting the coal face about better ways of doing things; of breaking down silos and getting different teams into the same room together to collaborate and feedback to the business; driving a culture of ownership, buy-in and continuous improvement; favouring iterative, time-based activities over slam dunk delivery. Change and improvement is considered a journey, not a destination. Documentation and system adoption is key to getting IP out of people’s heads (like complex standalone spreadsheets), as well as standardising and automating processes. Once you have created a strategy, you need to translate it into a delivery model, and this is effectively the budget or forecast at a financial level. But how do you pull all these strands together though, to allow BPM to unlock your agile culture? You don’t get there with spreadsheets, that is for sure. Fortunately, as so often is the case, the very technology that has opened Pandora’s Box has also enabled a new generation of business tools that will facilitate this agile shift. Budgeting and forecasting can generally be viewed as the ground zero of a financial cycle, so let’s start there. A web-based interface rather than a spreadsheet can make financial data input and review accessible to anyone in your organisation. Now, non-financial managers can easily give you the figures you need, in a standardised format that can be rolled-up into a single version of the truth. You bypass the ineffective, time-consuming, and soul-destroying spreadsheet go-round, shaving weeks and months off the budget cycle in the process. And, importantly, by providing increased visibility and transparency, especially of business strategy, you foster buy-in to, and ownership of, the budget. This way of working also opens the door to considering zero-based budgeting (ZBB). This bottom-up budget approach, where instead of adjusting the previous year’s numbers you start from a greenfield site and build your budget around what your strategic objectives are, has traditionally been dismissed as a pipe dream. Nice in theory, especially as it has been proven to save money, but too difficult and time consuming to implement in real life … Really? If we accept that the world is rapidly changing across the board how relevant is trend analysis for the past five years as a basis for projecting the future? Or even the relevance of basing this year’s budget on last year’s numbers? So, considering the arguments above, is ZBB not only doable but also a practical way to empower your new, agile, future-proofed finance culture? It ties the budget directly to corporate strategic plans and allows for rethinking of the way things have always been done. Empowerment, transparency and ownership in and of themselves, whether you adopt ZBB or not, will lead to better budgeting and budget management. As the actual numbers become available for comparison with the budgets, the same transparency drives the empowered user at the coal face to be more invested in delivering against that budget. Compare this to a manager that is handed a budget that they have had little or no involvement in, and yet are still expected to deliver against. So, a hat trick of agile, business process management and zero-based budgeting can transform your financial processes from drudgery and frustration, into a user-friendly, creative process that drives innovation in your organisation. Ultimately, if your budgeting and forecasting process is more effective and responsive, this will impact your bottom line positively. This is the catch-22 companies face today. There is no doubt that companies need to innovate to ensure their future success, but to do this their people need to find the time to think, research, experiment and develop new ideas. Because we’re in the business of saving people time, last year we ran an informal survey of some finance team members working in a range of industries to find out what takes up their time, and what else we could do to create time in their days. It’s astonishing that today, with all the technology we have at our disposal, manual processes are still taking up so much of our time. This is a triple whammy: the time taken by highly skilled staff to do the work in the first place; the knock-on effect of errors or incomplete data; plus, very often automation is the first step towards, and prerequisite for, further innovation. So the fact that lack of automation crops up twice in our survey as a drain on time is very worrying. Ad hoc reporting requests are an indication of an unempowered workforce needing to defer all finance related matters to the accounts team. As well as the drag on time, this means the people at the coalface of the organisation aren’t engaged with the budgets they are responsible for implementing. This can be seen, unfortunately, as a proxy for a wider lack of transparency, ownership, trust and decentralisation of power in an organisation. Time and time again, these factors very factors are the keys that promote an innovative and entrepreneurial culture, while a command-and-control management style is an effective way to shut innovation down. So where does this leave companies caught in this catch-22? The companies that feel like they are running just to stay in the same place, but know they need to make fundamental, exponential changes to survive into the digital future. The range of time blackholes revealed by the survey shows that there is no single culprit, and so no single solution. It’s a complex world, after all. What is clear, however, is that tired, ineffective, dated processes need to be sped up and automated. Your people need to be spending less time compiling the report, and more time analysing and thinking about the outcomes. Automation will also improve the timeliness of your data for real-time decision making. And if, as part of the fix, you have included those at the coal-face in the process, your data will be more accurate, relevant and timely. Inclusive management also increases transparency and accountability, resulting in an aligned organisation that manages itself better. So by resolving the catch-22, the outcome is not only winning the time you need to innovate, but also gaining the data, culture and other capabilities you need to succeed in a digital world.